Stretch Glass Society President Cal Hackeman will represent SGS with a stretch glass display at the Texas Carnival Glass Club 40th Anniversary Convention and Auction, to be held March 20-23, 2019 in Dallas. Cal will also be a speaker at the convention. More details on this event will be posted as they become available. The SGS makes regular appearances at a recurring event called the Eastern National Antique Show, one of the leading antique and glass shows in the U.S., to exhibit stretch glass, provide information on stretch glass and the SGS, and offer stretch glass ID. Exhibitors frequently offer a wide range of stretch glass, EAPG, depression-era glass, cut glass, art glass and more for sale. At previous shows buyers have been able to acquire hard to find as well as readily available stretch glass at competitive prices. For more information on the show, click on the above link to their website. The Michigan Depression Glass Society hosted their 46th annual show in Dearborn, Michigan on November 3 and 4, 2018. 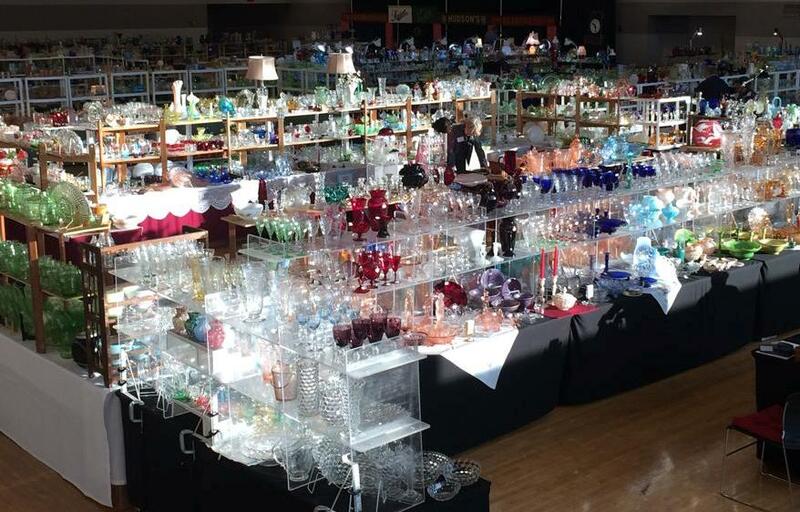 Two dozen dealers filled the 15,000 square foot facility with vintage American-made glassware. In addition, the club created a You Light Up My Life display, showcasing a variety of glass candlesticks, lamps, and fairy lights. MDGS also welcomed Cal Hackeman, who represented the Stretch Glass Society with a booth that will promoted both SGS and the glassware we all love to the 1,200 attendees. The fun continued on Monday, November 5, when MDGS hosted their monthly meeting where Cal presented a program on Stretch Glass. Additionally, an MDGS member presented a table setting of the Molly pattern by the Imperial Glass Company in black. For more information about MDGS, visit MichiganDepressionGlass.com. Stretch Glass Society Board member and Imperial Glass researcher Gary Senkar gave a presentation on Imperial Jewels and Imperial Stretch Glass to the American Carnival Glass Association’s members at their annual convention in Marietta, Ohio, on June 15, 2018. The SGS thanks Gary for sharing his expertise on Imperial stretch glass, including Imperial’s Jewels, on our behalf. Gary’s presentation is part of our ongoing outreach program designed to educate and inform collectors of all types of glass about Stretch Glass, and his talk resulted in 5 new SGS memberships. To view the complete gallery of photos, click here.